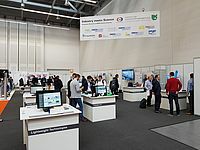 At international trade fairs, contacts can be nurtured, new networks can be established and, in the long term, the reputation of the cluster can be enhanced. 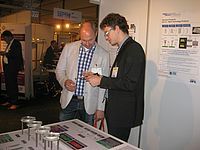 Visiting trade fairs and presenting the Institute and its R & D are therefore important activities for IKV. The world's most important trade fair for the plastics and rubber industry is held every three years in Düsseldorf. It is the big attraction for all international specialists from the segment because it showcases the entire range of products and services, presents the latest state of the art, and discusses pioneering innovations and visions for the future. In 2016, IKV's attendance at "K" focused above all on Industry 4.0 and additive manufacturing. JEC World is the world's largest composites fair. The trade show covers the complete value chain from the raw materials and processing to the final product. Together with its partner institutes: the Welding and Joining Institute (ISF), the Institute of Structural Mechanics and Lightweight Design (SLA), the Institute of Textile Technology (ITA), the Institute of Automotive Engineering Aachen (ika), Fraunhofer Institute for Laser Technology (ILT), Fraunhofer Institute for Production Technology (IPT) and the Laboratory for Machine Tools and Production Engineering (WZL) of RWTH Aachen University, IKV was represented at JEC World 2018 under the leadership of the Aachen Centre for Integrative Lightweight Design (AZL). The partners demonstrated the latest technologies and innovations from the field of production technology of fibre-reinforced plastics. For many years now, IKV has been represented at the annual Kunststoffen fair in Veldhoven in the Netherlands. The fair is the largest plastics exhibition in the Benelux countries. Because of Aachen's proximity to Benelux, there is always a lively exchange of ideas and experience, making the event a good example of the cluster's international activities. At the last Kunststoffen fair on 26 and 27 September 2018, IKV again had a stand and had many interesting discussions with the numerous visitors. There was also a large audience to hear the paper presented by IKV scientists on the potential of networked production processes, which was one of the forty or so interesting presentations on innovative materials, moulds and processes. Apart from describing examples of current research and development, visitors were also given a review of innovations that have been presented at this plastics exhibition over the last 20 years. Composites Europe, with over 10,000 visitors from more than 60 countries, is an established European trade fair and a business forum for composites, their production, processing and application. IKV regularly has a stand at this annual industry event. 2018, together with its partners, IKV presented on the "Industry meets Science" area some of the latest developments in fibre-reinforced plastics in the context of process engineering, design, quality assurance and repair. Fakuma in Friedrichshafen is a leading global event for the field of industrial plastics processing. Visitors can find out the latest news on all processes, technologies and tools that are of relevance for plastics machining and processing. 2018, together with the Fraunhofer Institute for Production Technology (IPT) and the Fraunhofer Institute for Laser Technology (ILT), IKV presented the latest developments, ranging from the design of optical systems and the construction of the tools and mould inserts to optics replication. They were on the joint stand of kunststoffland-NRW e.V. and highlighted the topic of "Plastic optical components from Aachen". 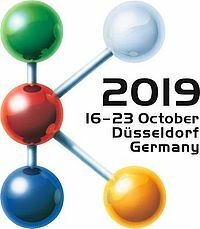 Plastics in car manufacture dominate a large number of research topics at the IKV – Institute for Plastics Processing. For this reason, the big International Motor Show IAA in Frankfurt is a very important event for IKV. For its presentation at IAA 2017, IKV bundled its research topics in the automotive segment into four main areas, namely: Development of hybrid parts, Solutions for lightweight construction, Product development with complex materials and Process development in injection moulding. IKV scientists illustrated these topics on four "themed islands" with the help of exhibits and presentations. Hannover Messe is the world's largest industrial trade fair. Around 220,000 visitors and 5,000 exhibitors met in Hanover at the world's largest exhibition centre from 23 to 27 April 2018. For the first time IKV presented itself and its research on a joint stand with Yizumi Germany. The highlight here was the hybrid production cell, which, based on a screw-based additive manufacturing process for the rapid processing of standard thermoplastics, permits the industrial integration of further manufacturing processes, such as machining or assembly work. The automated combination of additive manufacturing and assembly line production was presented in detail.